Schaeffer Manufacturing Co., one of the oldest family-owned companies in the state, has expanded with the purchase of a $1.5 million manufacturing plant in south St. Louis. The deal, which closed Oct. 22, is expected to boost company revenue to $150 million within 10 years, according to Chairman John Schaeffer Shields. 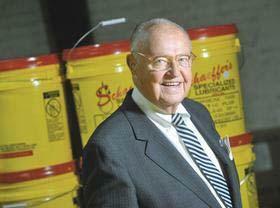 Schaeffer is on track to post $90 million in revenue this year, up from $84 million in 2009, Shields said. The company makes specialized synthetic oils, fuel additives and other products for the construction, trucking, agriculture, marine, mining and racing industries. The company's employee count also is expected to grow. Schaeffer currently employs 80 people at its home office and 500 sales associates throughout the country and expects to add 25 to 30 salespeople a year, Shields said. Schaeffer purchased a 60,000-square-foot manufacturing plant at 135 Victor St. from Hager Cos., a hardware manufacturer, which has corporate offices that neighbor Schaeffer's. The acquisition brings Schaeffer's total workspace to about 200,000 square feet. Shields said the plant gives the company room for future expansion and its location "at the extreme end of our complex," gives it security in the event of a calamity. Moffat Construction Co. of St. Louis is handling the construction. With new machinery, the plant is expected to be operating in January. Founded in 1839, Schaeffer began business as a producer of soap, candles, engine oil for steamboats and axle grease for Conestoga wagons before switching to industrial lubricants. The company does business in 40 countries in addition to the United States. Schaeffer is led by Shields, CEO Tom Herrmann and President Jay Schaeffer Shields. The Shields and Herrmann families own the company.